Ratnadeep Gopal Adivrekar, Discourses of Prismatic Truths 4. LUXEMBOURG.- Galerie Schlassgoart presents Discourses of Prismatic Truths a solo exhibition of Ratnadeep Gopal Adivrekar through November 11, 2011 at Pavillon du centenaire/Arcelor Mittal, Luxembourg. The artist has gained recognition with his exhibition at the NUS Museum, Singapore 2009, and Galerie Sylvia Bernhardt, Germany 2010 amongst the several solo shows held by him. Born in 1974 in Mumbai, Ratnadeep received his first class in Fine Arts from the Sir J.J. School of Art Mumbai. His work was included in the exhibition Imprints at the Ueno Royal Museum, Japan and was the recipient of the prestigious Governors Prize in the Visual Arts. Ratnadeeps recent solo shows include exhibitions at Galerie Sylvia Bernhardt, Germany and the NUS Museum Singapore. Philosophy, knowledge has always been greatly emphasized in Ratnadeeps life .To Ratnadeep, human relations is not based on a single linear model but a set of complex interactions fueled by personal experiences, expectations and interpretations of one anothers actions. Based on the ideas of perceptions and reality, Ratnadeep wants to portray the existential human condition through the instantaneous coexisting chronologies in ones life. Motivated by his viewers artistic appreciation, Ratnadeep strives to evoke the memories and visual intelligence of his viewers through his artwork. His desire to see everything at once is apparent in many of his paintings, perhaps most overtly in the overlay of one image on top of others, as if it were possible not just to see through a particular image but to hold them both in a sort of suspension. In these superimposed, suspended and translucent images the structure of narratives is overt. Each of the images is both there and not-there, as the eye is drawn from one to the other. Many of Ratnadeeps canvasses are marked by small objects which usually appear to be the utter foreground of the canvasses and to be the fixed points around which the pictures beyond them are held in place. The objects which overlap his works are things that suggest personality and those which are not just things but judgments in themselves. In many cases these objects can also be read as references to the various technologies of vision. In a sense they can be understood as points de caption, holding the flux of the signifiers beneath them into a single moment, pinning the images, as it were, but still without fully endowing them with meaning. In other words, in order to see everything, and to see everything at once, the frame is frozen, still permitting the impact of the swirling meanings but imposing the mark of a field of control over their movement. Through Prismatic Truth the spectator is subjected to a whole variety of discourses and codes whose aim is to re-contextualize and re-function the artifacts of our consumer culture which ask to be considered as critiques of the time and place in which we live. For many contemporaries, arts points of reference are still the self reflexive languages and forms of art itself and/or the depredations of the increasingly complex culture. It is still possible that Ratnadeep's work could be understood as another attempt to supply art with a sense of authenti¬city and relevance - an attempt that might itself be reactionary with aura and authenticity attesting only to the historical decay of these qualities. He clearly puts a lot of thought and meticulous planning into the construction of his work. 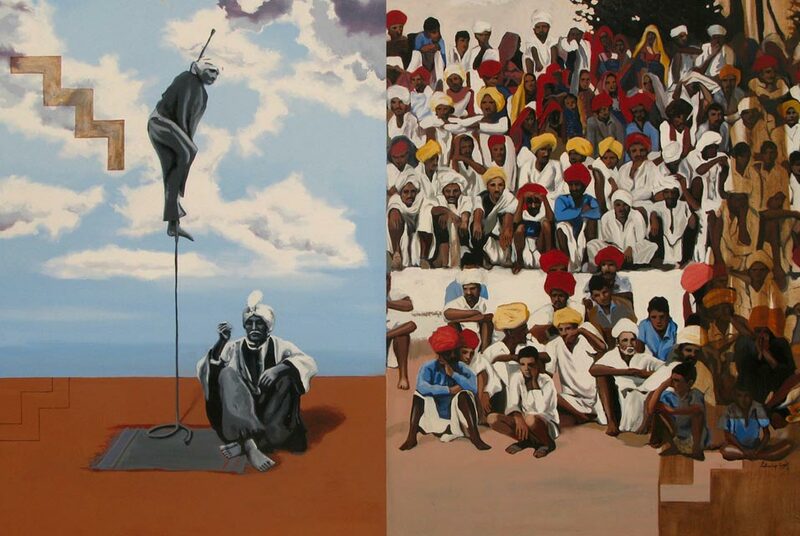 A well-rounded contemporary artist who does not abandon his tradition, many of Ratnadeeps work still carry elements that are traditionally considered post-modern Indian art. Through his work, he demonstrates a deep passion for history, arts, politics, literature, philosophy and social issues. To him, appreciation for various aspects of humanity is more meaningful than creating an image on canvas for the sake of creating art. He wants his art to challenge his viewers way of thinking. In many ways, he encourages viewers to broaden their horizons and expand their knowledge.